5066 ✉ 17 10 Pfg. 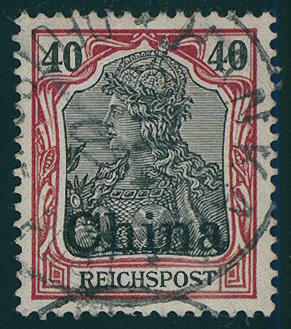 Germania-Reichspost with overprint \"CHINA\", fresh colors, two perforation shortened, otherwise in perfect condition as so-called \"cathedral Provisional arrangement\" on decorative small-format cover, unopposed used with postmark \"cathedral 25.11.01. 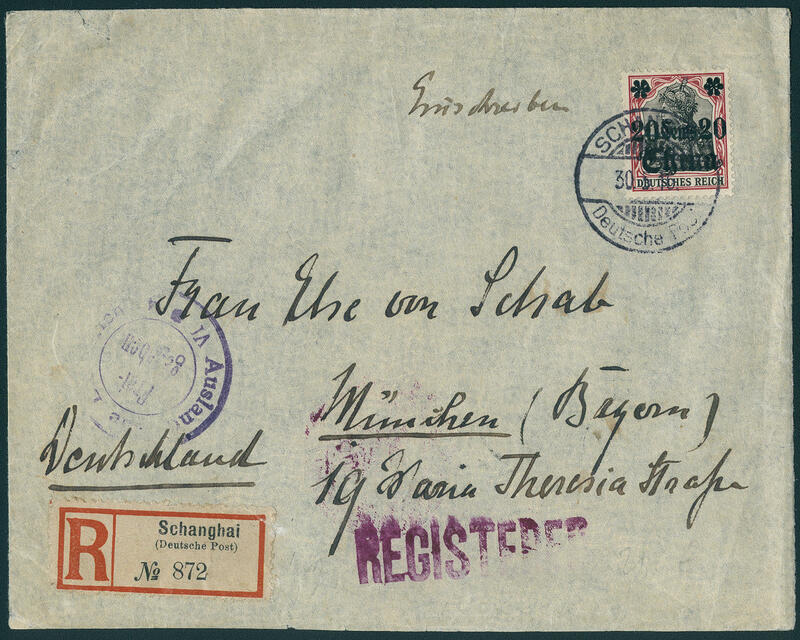 \" to Tsingtau / China with transit cancellation \"BERLIN C1 NAVY-POSTBUREAU 26.11.01. 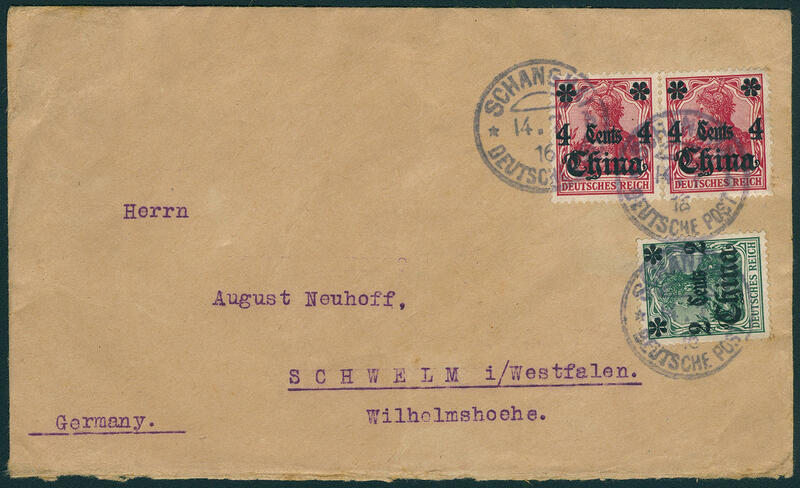 \" and arrival postmark \"TSINGTAU KIAUTSCHOU 5.1.02. \". A very interesting and extraordinary cover! 5067 ✉ 18 20 Pfg. 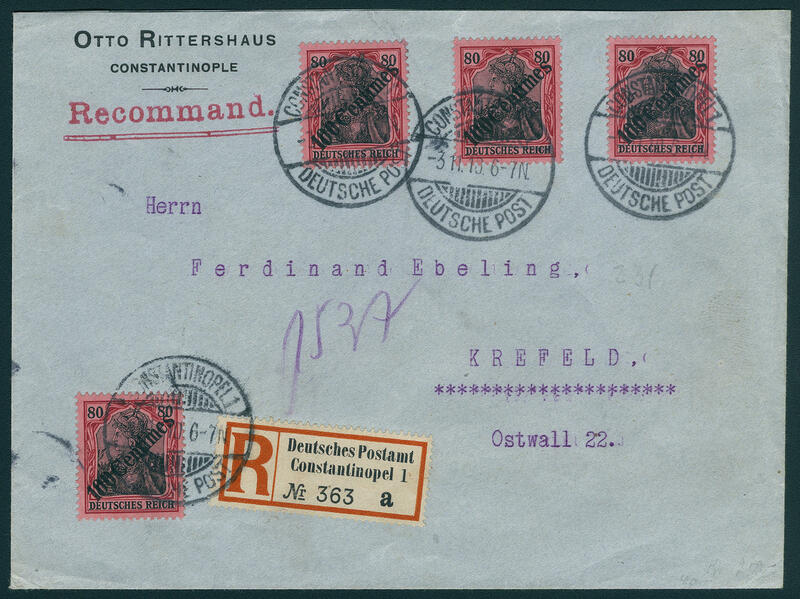 Germania as correctly franked single franking on army postal service insured letter (weight 74 Gram), the stamp with small faults, cover as usual traces of usage, with two clearly single circle postmark \"K. D. FIELD postal service station No. 7 28 / 6 (01) \" (Paotingfu) to Hanover lindens with arrival postmark. 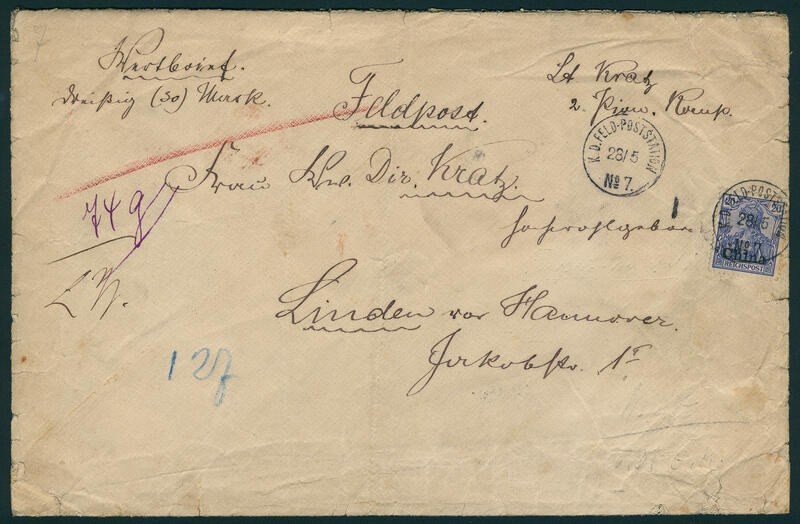 Insured letter of the army postal service are anyway extraordinarily rare. This here with an indication of value over 30 Mk. Was actual free of postage (pending 150 Mk. ). There he however above 50 Gram weighed, must he additional franked become. 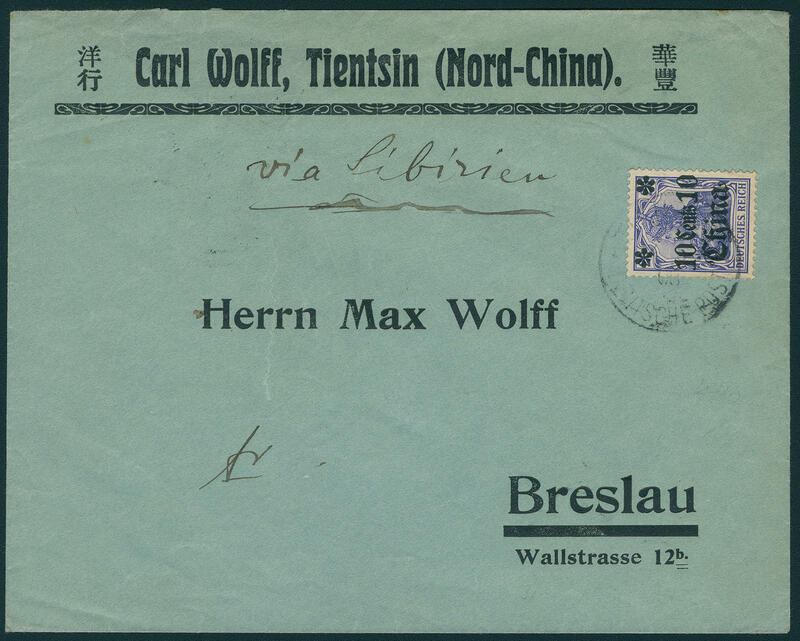 A postal history Top-rarity of the German post in China! 5068 ⊙ 21PFIV 40 Pfg. 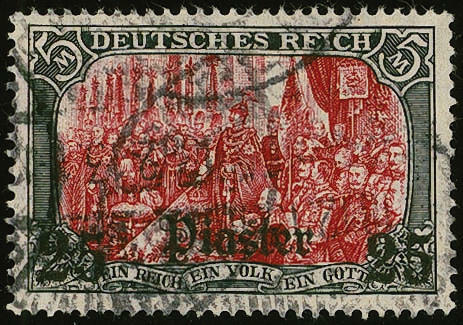 Germania with scarce plate flaw \"O IN REICHSPOST at the bottom oblique sliced\", neat cancelled Michel 350,- €. 5069 ✉ 31II 10 C. On 20 Pfg. 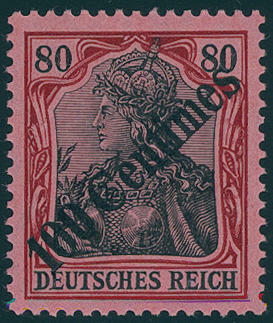 Germania with very rare overprint variety \"left rosette damaged\", fresh colors and well perforated in perfect condition as correctly franked single franking on cover from \"TIENTSIN German post\" with handwritten notation \"VIA Siberia\" to Germany with arrival postmark \"Wroclaw 4.6.08. \". Already lots used counts these variety to the rarities of this area. On cover a definitely top piece from utmost rarity and due to missing offers also in the Michel special catalogue only noted without price! 5070 ✉ 39,40a 2 C. On 5 Pfg., as well 4 C. On 10 Pfg. (2) as correctly franked franking on decorative, commercially used cover with clear single circle postmark \"Shanghai 14.7.16. 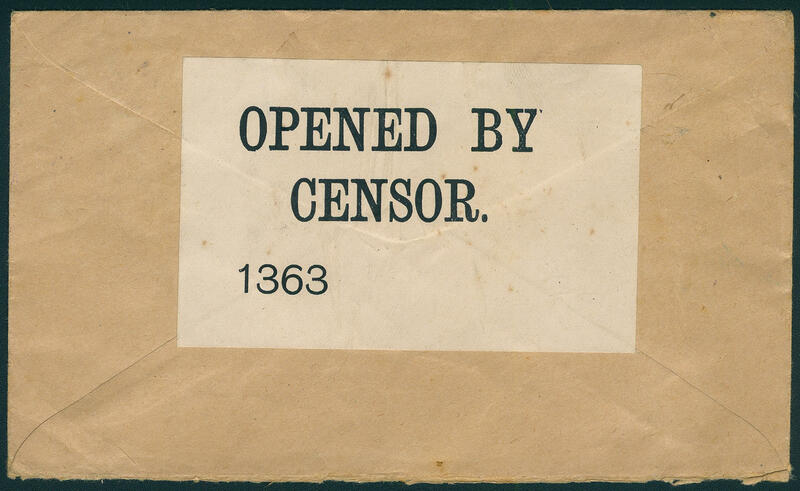 \" with on the back censorship list \"OPENED BY CENSOR 1363\" to Schwelm. A rare censored letter from the 3. War year! 5071 ✉ 42 20 C. On 40 Pfg., in perfect condition as correctly franked single franking on registered cover from the wartime from \"Shanghai 30.5.16. 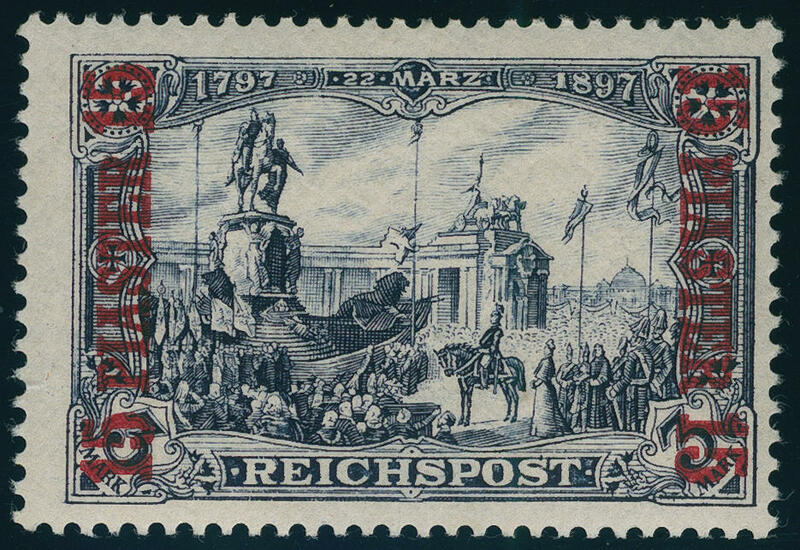 \" to Munich with on the back transit stamp from New York and arrival postmark, as well censorship list \"OPENED BY CENSOR 4196\" and on face censorship stamp \"foreign country place EMMERICH released\". A very nice and rare war postal letter with double censorship! 5110 3NeI 1 piastre on 20 Pfg. Medium ultramarine, overprint blackish blue, metallically shining, very rare reprint from Georges Foure, wonderful having bright colors, nearly mint never hinged outstanding quality this large rarity without any signs. 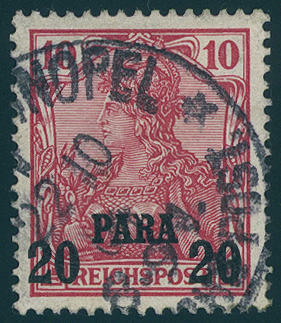 There are less than 20 examples from this known, with the result that issue to the largest rarities of the German international post offices abroad counts! Photo expertize \"faultless condition\" Jäschke-Lantelme BPP. 5111 7e 20 para on 10 Pfg. 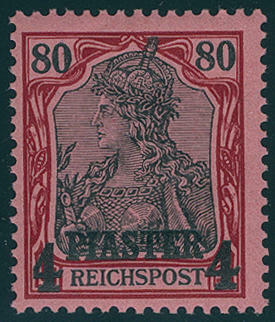 Dark rose red, fresh colors and very well perforated from lower margin, in perfect condition mint never hinged in utterly perfect condition, without any signs. An exception copy this very rarely colour for the highest standards! Photo expertize \"faultless mint never hinged condition\" Jäschke-Lantelme BPP. 5112 9a 1 ¼ P. On 25 Pfg. 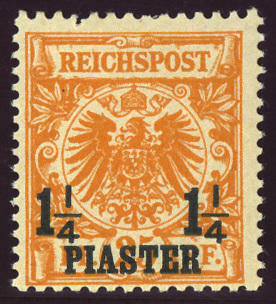 Yellow orange, the very scarce first issue, wonderful fresh colors and except for a missing tip in perfect condition mint never hinged photo expertize Steuer BPP. Michel 3800,- €. 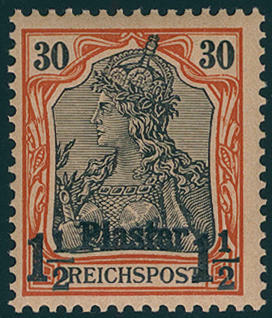 5113 9ba 1 ¼ piastre on 25 Pfg. Dark orange, fresh colors and very well perforated, in perfect condition mint never hinged, without any signs. There are very few perfectly mint never hinged examples from this known. A rarity of this area! Photo expertize \"faultless mint never hinged condition\" Jäschke-Lantelme BPP. 5114 ⊙ 13IaAbart 20 para on 10 Pfg. With interesting overprint error \"R IN para above broken\", small corner crease, neat cancelled \"CONSTANTINOPEL\". Interesting piece! 5115 ✉ 19 4 piastre on 80 Pfg., two examples fresh colors and in perfect condition as scarce correctly franked multiple franking on complete package card, these with as usual slight traces of usage, from \"CONSTANTINOPEL 23.4.04. 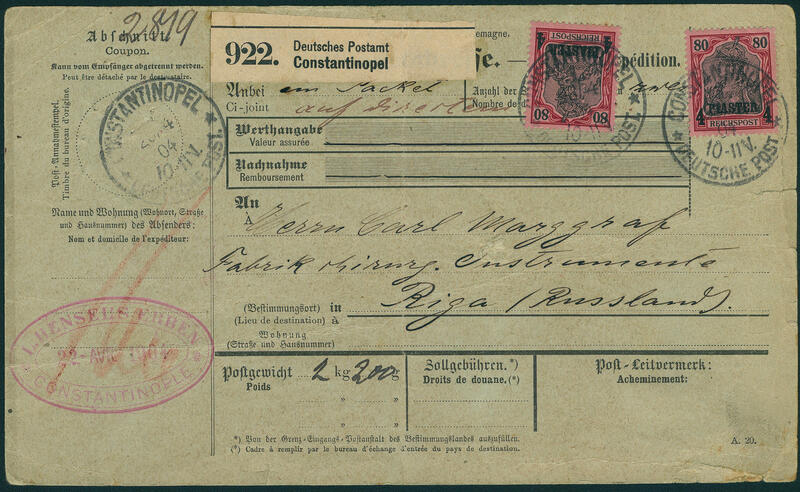 \" to Riga / Russia with arrival postmark, as well transit cancellation from \"CONSTANTA 27. April 04. \" and \"JASSY\". 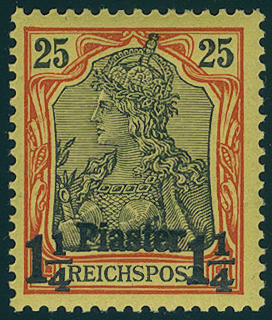 Complete package cards of the German post in the Turkey are general rare. 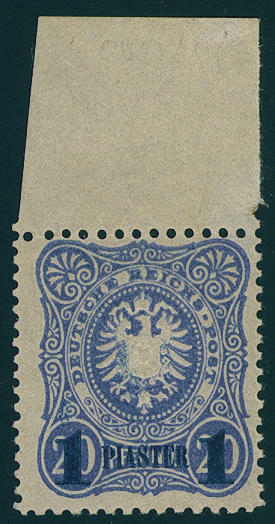 With pure multiple franking are only a few copies became known. With this extraordinary destination a rarity of this area! 5116 ⊙ 23I/IDD 25 piastre on 5 Mk. 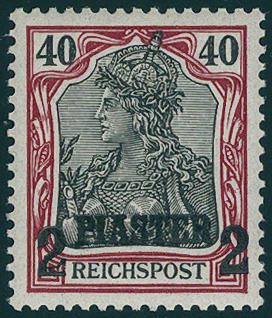 Reichspost, with spectacular variety \"double overprint\", having bright colors outstanding quality with clean and tenuous mounted single circle postmark \"CONSTANTINOPEL 10.11.02. \" in perfect condition. The edition this sensational variety is to the current knowledge on only a sheet to 20 pieces. These were on package cards commercially used up. It only eight examples from this known, the to the all large rarities of the German international post offices abroad and colonies count. Photo certificates Bothe BPP, Dr. Hollmann BPP. 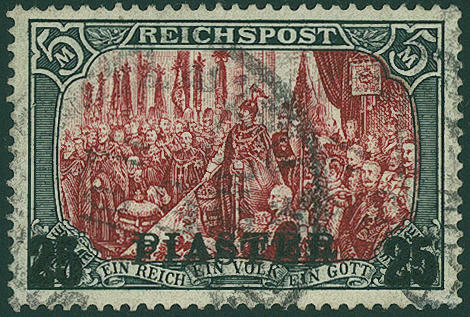 5117 I/V 1 1 / 4-4 piastre, all five not issued Germania values, fresh colors and very well perforated, in perfect condition mint never hinged issued only 300 sets! Photo expertize \"perfect mint never hinged condition\" Jakubek. 5118 VI/I 15 piastre on 3 Mk. 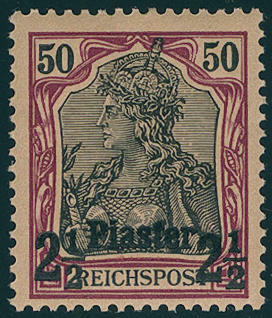 Violet black, original stamp in type I, wonderful fresh colors and very well perforated with original gumming, nearly mint never hinged causing. 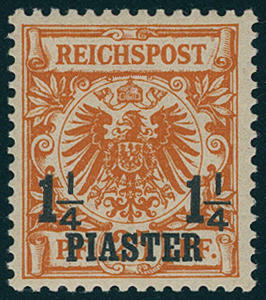 From this not issued stamp are only a few copies became known, the to the all large rarities of the German international post offices abroad count. Of an of the most beautiful known examples for the highest standards! Photo expertize \"faultless condition\" Jäschke-Lantelme BPP. 5119 41I 22 Pia. 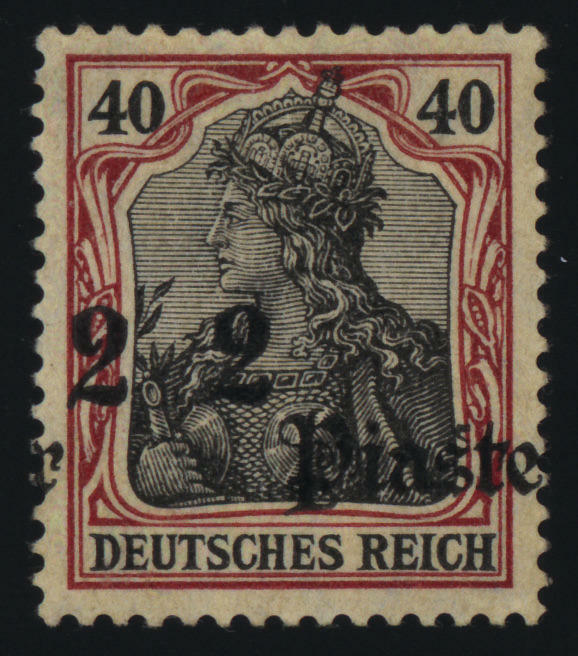 On 40 Pfg., the very scarce overprint variety, in perfect condition unused issued only approximate 40 piece and a great rarity of the German international post offices abroad. By Michel undervalued. Photo expertize Bothe BPP. 5120 ✉ 41I 2 piastre on 40 Pfg. 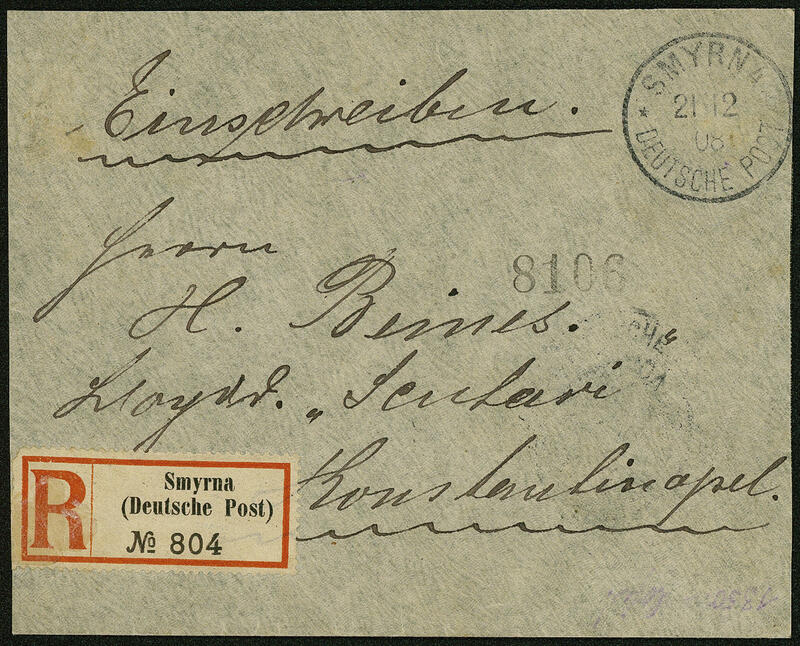 Germania, the extremely strong shifted overprint, fresh colors and very well perforated reverse on very nice registered cover, correctly franked as a single franking used from \"SMYRNA 21.12.08. 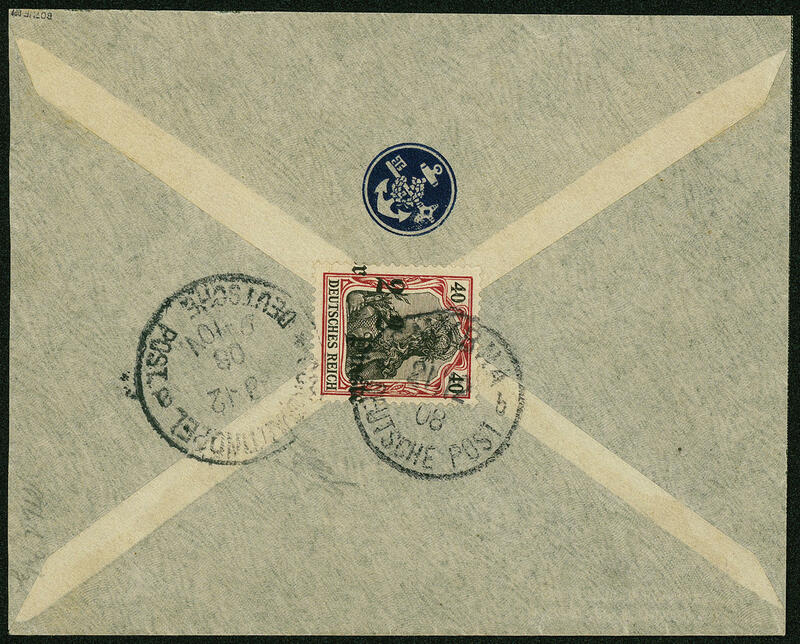 \" to Constantinopel with arrival postmark, three sided opened. 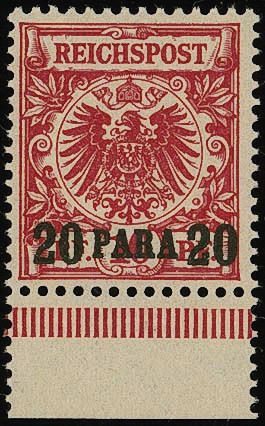 From this spectacular variety are only very few letters have become known, the to the large rarities the international post offices abroad count! Photo expertize Jäschke-Lantelme BPP. Michel 10000,- €. 5121 ⊙ 47M 25 piastre on 5 Mk. Black / dark carmine, the very scarce so-called \"Minister print\", fresh colors, minimal faults, with postmark \"CONSTANTINOPEL 18.12.13. \". There are only few examples from this known. A rarity of the German international post offices abroad! Photo expertize Jäschke-Lantelme BPP. Michel 5000,- €. 5122 48/52 Postal stamps set 1908, as well 10 C. In both colours, in perfect condition mint never hinged, expertized Jäschke-Lantelme BPP. Michel 338,- €. 5123 ✉ 52 100 Cts. On 80 Pfg., four examples of the top value as very decorative multiple franking on philatelic registered cover from \"CONSTANTINOPEL 3.11.10. 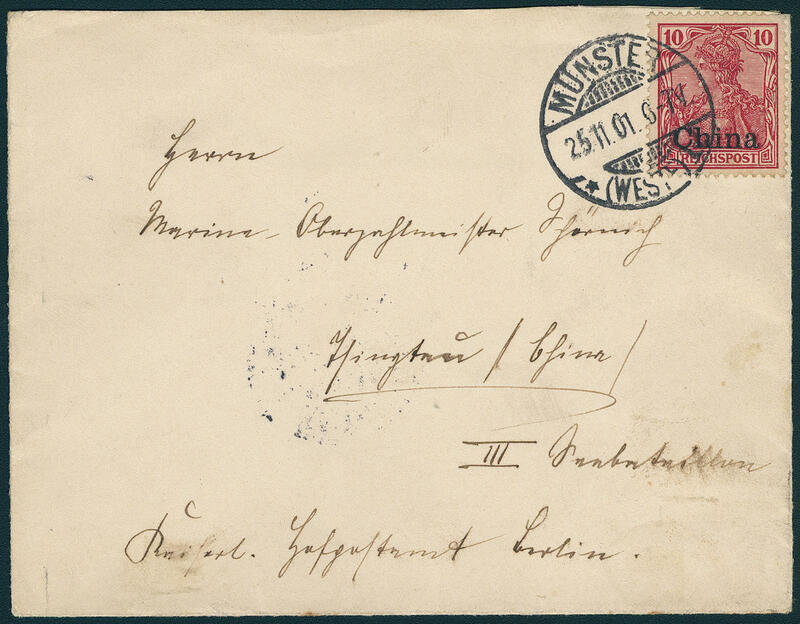 \" to Krefeld with arrival postmark. A very decorative document! Photo expertize \"faultless condition\" Jäschke-Lantelme BPP.